When I was young, about eight or nine, I used to like those books from the Illustrated Classic series. I didn’t like reading them – none of the stories particularly interested me aside from HG Wells’s The Time Machine. But I wanted to make one of my own. So I asked my dad to bring me sheets from his office. And I’d cut them up into small squares and staple them together and start writing. Nothing interesting ever came of it until my dad’s co-worker started giving him Japanese role-playing games for me to play on my Super Nintendo. I only met the co-worker once, but it had great influence over me. So my stories started having shinigami, all manners of oni and yokai, and god-slayers and floating fortresses. It branched out of that, but that’s how it started. What interests you in the short story as a form? Short stories offer one main thing for me: accessibility. Accessibility, as in not just being more accessible and digestible to an audience, but it allows for greater experimentation of ideas and devices that would get tiring in long-form. Also, some stories just work better with a very limited number of characters. How I see short stories as well are as slices of life. They stop instead of end. I’d say the economy of words in ‘Passage’ works towards its poignancy – I imagine it as if someone is sitting next to you in a pub and telling you this story. The story belongs to those characters, to Trinidad, to the Caribbean. But its emotions and evocations belong to the world. Where do you find your themes, or how do they find you? Trinidad is filled with strange situations, many that spin in and out of the news cycle. An example I find myself bringing up recently is a scenario that occurred about a year ago in La Brea, in south Trinidad. A mother’s baby died and the mother still cares for the baby weeks later. Not only the mother, but the entire family of that household. Most people here cast it off as just madness — it is important to look beyond that. There’s a lot to understand. Situations like these help me internalise, and characters and stories grow from them. Your prize-winning story touches on issues of child and social care – how did you come to write this work? It’s based off of a true story, of a family in Point Fortin that lived under similar circumstances – of course, it’s not the exact situation. When I was fifteen or sixteen, there was a push to get the local newspapers in each classroom. I remember following this story and slowly seeing it slip from the front page to page 7 to oblivion. The last thing I’d read about it were the displaced children screaming at the technology around them. Was it really the right thing that had been done? Would it have been worse if they’d been left in that house? It wasn’t my aim to denigrate that family when writing this story. But it was important to try to understand. Can you tell us a bit more about the language you use in the story? The story is narrated in Trinidadian Creole English. Most of us here speak it, but we’ve never learnt how to write it. So writing it for the first time, years ago, felt incredibly unnatural. In our examinations, we’re only allowed to write it between dialogue tags. There’s no standard way to write it. I don’t aim for 100 percent realism in the dialect, because I do use a bit of poetic flourish in my work. Gangsters quoting Robert Frost poems, streams of consciousness. Because why not? That’s my thing, my signature on it. Is there something specific you have set out to achieve with your writing? An insight into Caribbean darkness, and helping angle the light towards it. I want to do it with different genres: crime, horror, fantasy, science fiction. We need more of that in the Caribbean. It’s important to have diversity in our Caribbean stories, as we have diverse readers. And now a bit about your own bookshelves. Can you remember the first book you bought? When I was 9, I wrote a short story titled ‘My Transformed Neighbourhood’, about a boy who wakes up in an alien world. I mailed the story to the Kids section of the Trinidad Guardian, a local newspaper, which published it. They gave me a book voucher as payment. I used the voucher to get The Greedy Rabbit by Enid Blyton. My copy is still pristine, as if I’d bought it this morning. How big is your library? About 400 books, I’d say. Novels, graphic novels, poetry books, non-fiction, and I enjoy getting encyclopedias and collector’s edition guides based around video game lore – my Dark Souls one arrived a few days ago. I’m currently mapping out a space in my new place to organise my books. But I’d like to do it by feel, rather than genre or author. Books that are light-funny, dark-funny, tragic, books that make you feel less lonely, books that bring the darkness to mind, things like that. Fiction – my bed. Non-fiction – the toilet. It’s tough. Even the worst books I’ve read have something in there worth keeping it for. Even if it’s just keeping them as a reminder of how bad ideas pan out. Paper Based Bookshop, an independent bookshop based in a hotel, usually has some nice surprises. It’s one of the only ones in Trinidad to carry local and regional literature. It’s nice to have staff that are actually passionate about books as well. Too much. But to name a few – Outer Dark by Cormac McCarthy, Snow Crash by Neal Stephenson, the entire Akira volumes, and A Brief History of Seven Killings by Marlon James, which is a novel that looks so intimidating I fear I’ll be putting it off for the rest of my life. For my birthday a few years ago, my fiancé got me a 1985 edition of The Bachman Books, when Stephen King wrote under the pseudonym Richard Bachman. What’s special about this older edition is that it contains Rage, a novella that King let fall out of publication because it was associated with school shooters. I’d borrowed a copy when I was 16. I’m one of the only people in the world who returns borrowed books, and I regretted not stealing it. But I’m extremely glad now to have another copy in my library. It’s there – it’s meant to be wrinkled, broken. A book is probably the only entity that doesn’t become paralysed once the spine is broken. Depends on the book. If you want a Dean Koontz, sure, go ahead. A Cormac McCarthy? Get the hell outta here. Absolutely. I have a good number of signed books. Trinidad is a hub for Caribbean literature when the Bocas Literature Festival takes place, bringing together writers from all islands from the region, including some special guests. I try to buy their books, get their signatures on them. I don’t know when I’ll get to read them—but the signatures are there! 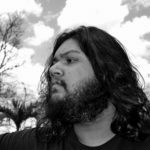 Kevin Jared Hosein’s novel, 'The Repenters', was nominated for the 2018 International DUBLIN Literary Award (formerly IMPAC Dublin). His work is also featured in anthologies such as 'Pepperpot: Best New Stories from the Caribbean', 'New Worlds, Old Ways: Speculative Tales from the Caribbean', and 'Akashic’s Duppy Thursdays'. He was shortlisted twice for the Small Axe Prize. His poem, “The Wait is So, So Long” was adapted into a short film which was awarded a Gold Key at the New York-based Scholastic Art and Writing Awards.